Too busy fighting figurative fires? 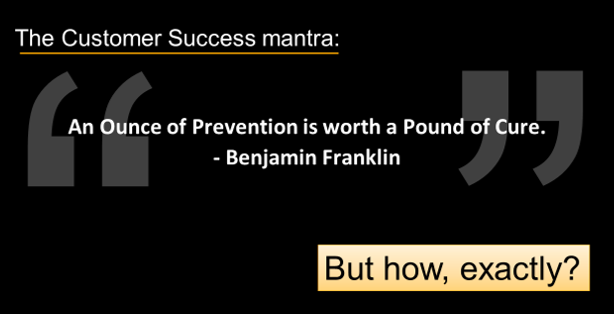 Upon benchmarking his native city of Boston to his adopted city of Philadelphia, Benjamin Franklin wrote the famous line “…an Ounce of Prevention is worth a Pound of Cure…” and instilled practices that were proven to reduce fires in the first place. Franklin’s efforts included the establishment of training, standardized equipment, regular fire companies, and new prevention methods including better utilization of chimney sweeps. USHistory.Org explains, “Thanks to the matchless leadership of Benjamin Franklin, the dire fear of fires expired in Philadelphia which became one of safest city’s [sic] in the world in terms of fire damage.” In other words, just bringing people to fight a fire wasn’t enough. Getting proactive was the fix for safer living. And so it goes with Customer Success. We all know we should be doing the right things that strengthen customer relationships and get ahead of the renewal so there are no unexpected surprises… but doing what, exactly? Screenshot of TopBox Account XRay, showing breadth, depth, and sentiment of key contacts in an account. CHALLENGE: Loss of an executive sponsor or champion opens opportunities for competitors in the account, or for the program that you support to be canceled entirely. SOLUTION: Proactively build rapport with all key stakeholders, so that there is strong support for your products and services surrounding any new leader. If you don’t do it in advance, trying to build those key relationships “in crisis mode” is unlikely to work. CHALLENGE: Happy and successful customers are far more likely to renew and expand than those that are unhappy or don’t see the value of your products and services. SOLUTION: Ensure your products and services are adding value for all customer contacts involved in buying/renewal decisions. Makers also need to know the extent to which your products and services are driving happiness and success for different parts of their company. Failed projects never look good, so the sooner these 2 important personae can uncover any gaps and remedy them the more likely their careers (and paychecks) are to grow. Internal stakeholders (Product Management, Support, Training, Marketing, Sales, Services) are starving for information that can improve their own results. Each of these teams needs to do the optimal thing. Lacking data, they will go with their own hypothesis and opinions about what is working and not working. When trustworthy and representative, feedback can be a powerful tool for accelerating profitable growth. Customer Success teams should be able to address gaps at the account-level, while cohort analysis enables the rest of the company to hear directly from customers to optimize the right structural improvements, such as product, process, and position. Just like you, our key customer Champions and Decision Makers also need to listen-in to those conversations around the water cooler. Any information that points to a failed initiative would certainly be something those personae want to address. For larger accounts where there is likely to be a Buying Committee making renewal and expansion decisions – whether formal or informal – recognize that your customer needs the same insight that CS teams need. Who’s happy and who isn’t? Why? What’s working well and what isn’t? Why are some people happy with the solution, and others are not? Don’t be afraid to share results with them (they are already discussing internally are aware of the “warts”) and instead take the opportunity to engage the Buying Committee in developing (or updating) the “joint success plan.” Solutions such as TopBox, with benchmark analysis, key drivers, and longitudinal trending will streamline this process. For smaller accounts where a single person may very well be occupying multiple personae, recognize that they want to know how you can help them get that promotion. Obstacles or improvement opportunities should be explored and addressed. But they don’t have time to meet with you and discuss. These folks need a rapid diagnosis from their feedback with templated processes and best practices that raise the ROI to show their management how they are contributing to the business. Your own internal leadership and cross-functional teams also want to know what causes customer churn. 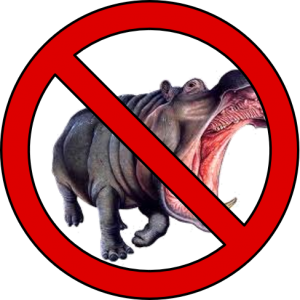 But they aren’t likely to take your word for it: In the absence of data organizations are attacked by the HiPPOs – Highest Paid Person’s Opinion – which is generally based on limited views of the end-to-end customer experience and anecdotes from a handful of contacts. Share the feedback results with them and to work to improve their results by addressing any gaps via best practices/lessons-learned. Solutions such as TopBox, with account-centric views, comparative benchmarking, and heat maps will streamline this process. And if you or your leadership is concerned by the transparency (e.g. “We can’t expose all our warts!”) know that the data is coming from your customers. They already know about the warts; it’s your company that may be in the dark. Champion their feedback with the rest of your company so the proper roadmaps and structural improvements can be prioritized. Analyzing the aggregated feedback results each quarter to spot trends or common patterns across accounts allows you to provide actionable insights to your colleagues across your company. By highlighting who has participated (accounts and persona) and the key themes, ideally linked to financials to strengthen your case, you’ll gain alignment with those cross-functional parts of the business that need continuous improvement. And solutions such as TopBox, with key driver analysis, financial linkage, and longitudinal trending will streamline this process as well. When positioned this way we routinely see participation (response) rates at 60%+. This level of participation not only improves the actionability of the feedback at the account level, but also easier and faster to identify patterns and obstacles to renewal because it’s far more trustworthy and representative than what any “survey” would ordinarily provide. 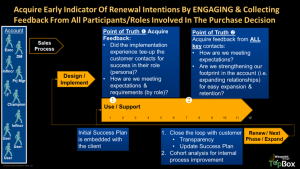 The solution is now clearer: Well in advance of the renewal, the CSM needs to know how each of the key customer stakeholders feel about key attributes of the customer experience. From value to ease, from best practices to posture, from customer experience to customer success, the Customer Success Manager needs to diagnose what is working well and what isn’t across the account – from each of those stakeholders – so that any barrier to renewal is uncovered and able to be addressed. Human interaction required: During the close of the sale (or at latest during your onboarding process), the team should be messaging the fact that their feedback is critical to their (and your) success, with an explicit “ask” if they will participate in structured feedback processes. Naming your feedback program adds credibility and evidence of its legitimacy, and by asking for their participation – even though the specific request for feedback won’t come for a few months – allows you to renew their own commitment when the time comes. Something magical happens when a human being provides a commitment to another human being. 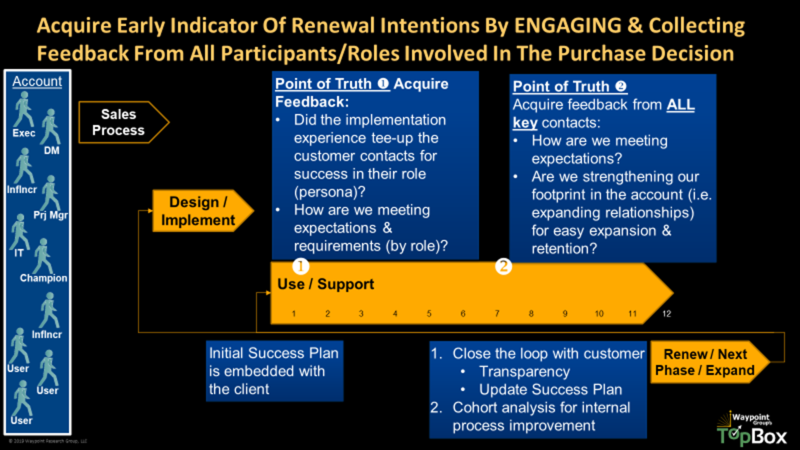 Next step (which could be automated for low-touch environments): In addition to acquiring feedback following your onboarding process and approximately 4- to 6-months prior to renewal, inform those initial customer contacts (and especially your Champion) that it’s time to get a view of what’s working well and what isn’t. Remind them of their commitment to “help us help you” and ask again if they will participate. Do your best to avoid settling for anything less than “Yes” with a reminder that you’ll be sharing results and that your company is committed to addressing customer needs and gaps (i.e. that the feedback won’t go into a black hole). This is also a good time to schedule that Joint Success / Business Review meeting (for large/strategic accounts, or via individualized communications where investing in a Business Review process doesn’t make sense based on account potential) so that you can demonstrate that you’re listening and address the feedback as the key agenda item in your Business Review with the customer. Full automation (this is a key opportunity to scale the discussions that CSMs are probably doing as “one-offs”): With this validated list of contacts, you are in a good position to provide a standardized but role-based questionnaire. Decision Makers have much different experiences than End Users, so be careful about the questions you ask! Drop me a note or connect on LinkedIn with the request and I’d be happy to share a template or two. Potential for automation: As a CS Manager you’ll want to follow-up on any issues that come out of your customer’s feedback. At minimum, you’ll want to share aggregated and anonymized feedback and highlight where the customer’s experience varies from similar accounts. Solutions such as TopBox, with account-centric views, comparative benchmarking, and heat maps will streamline this process. Human interaction: Update the Success Plan (a template is provided here). Especially with those large/strategic accounts, you’ll want to show up to your Business Review / Joint Success meeting with your impressions and suggestions for improvement, regardless of whether the necessary action items belong to their side of the table or to your company. Use this precious time to develop the right action items and gain buy-in to the plan that will address their most important gaps. No more “check in” calls, no more “surveys,” and no more chasing down renewals. By demonstrating that you are focused on adding value for them (your customers) you’ll be rewarded with easier renewals, stronger relationships, and advocates that accelerate expansion opportunities. What percentage of your customer accounts have the right set of identified contacts? The more-valuable accounts probably have more people involved in renewal and expansion decisions than small accounts, and they probably span a number of different personae. Set up guidelines to identify those account with poor coverage (footprint) so you can focus your human resources on optimizing the contact list so you’re strengthening relationships with the right people. What percentage of revenue is providing feedback? We continue to find that silent accounts – those not providing feedback – are far more likely to churn than accounts that are engaged with you to improve. How much of your company’s ARR is contained in that cohort of silent accounts, along with percentage of revenue in low-sentiment (unhappy) and high-sentiment (happy) accounts will help you further allocate human resources to the accounts that need it most. How are your account teams following-up on the feedback? Especially where there is a gap in customer expectations, the follow-up process is one of the most critical differentiators of your customer feedback/engagement program compared to a simple survey. Is your company following up in the right way and at the right time? While we’re proud that TopBox contains these (and more) out of the box, just creating and monitoring KPIs is insufficient. Embedding the right operational (process) metrics and making them visible and managed through Salesforce proves to be an effective and efficient mechanism to keep focus, coach for improvement, and drive accountability. Since we can’t be in 2 places at the same time, we need to pick and choose where we spend our time. Some tasks are ripe for automation, while others require a personal touch – humanization – that simply cannot be automated because of the value-add that a human being brings to a relationship. Customer Success needn’t be complicated, but it does need to leverage human-to-human interactions. Are you gathering real feedback in your lifecycle? Or are you just faking it with surveys that collect unactionable data? You know that Customer Success Managers can’t touch everyone in an account on a regular basis so they must utilize scalable methods for engaging the right contacts at the right time. Want to see how this process provides real-world value? Here’s a case story of a B2B technology firm that’s been reaping the rewards with this approach.